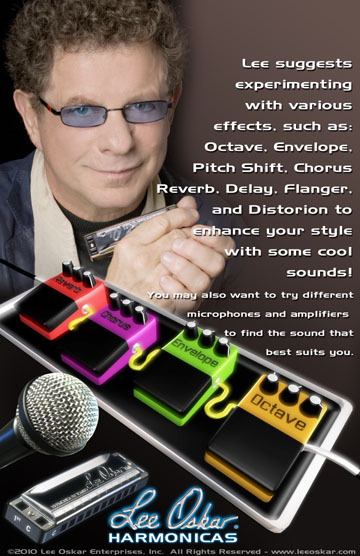 Lee Oskar feels that a player's sound is such a personal thing, that he doesn't really recommend a specific brand or model of equipment for everyone. Try anything and everything and find the sound you like. Lee does recommend that you go to your favorite retail store to try out your choice of microphone and try out every amp on the floor! That's the best way to find what works for you. Some people like a clean sound, some like a dirty sound, some like a distorted sound, etc. While you're at it, try out effect pedals too! Many products are marketed for the guitar but works just as well for the harmonica. It is important to choose your own microphone, for health reasons as well as your sound. Incorporating all kinds of accessory equipment can be a lot of fun and can really spice up your playing, too. Reverb - Simulates the reverberation which naturally occurs within a given space. Settings vary from small room, concert hall, cave or even outer space. Some musical instrument amplifiers are available with the reverb feature built in. There are two main types of reverb available, spring and digital. Delay - Delay is one of the simplest effects out there and one of the most valuable. A little delay can bring life to dull mixes, widen your instrument's sound, and even allow you to solo over yourself. Delay is also a cornerstone of other effects, such as reverb, chorus, and flanging. Echo - An echo device, or delay device, is a signal processor used to simulate discrete reflections of sound. Echo devices have taken several forms, including tape delay, analog delay, and digital delay systems. Chorus - Chorus effects can make a single instrument sound like a group of players. It adds a rich, lush, shimmering quality to your sound. Leslie Effect - a vibrato effect similar to the Leslie rotating speaker used for electronic organs. Harmoniser or Pitch-Shifter - Instrumental shifting allows one to change the pitch of a sound in real time. Octave - Produces a tone one or more octaves below or above the pitch of the original tone. There are many types, Analog and Digital. Sometimes analog octave units will have difficulty in tracking the original signal and produce the desired octave. Envelope Filter - An envelope filter is a bit like an automatic wah wah pedal. If you play a note with considerable attack you get a treble boost, and as the signal from the tone dies away the treble boost fades. Flangers and Phase Shifters - Flangers and phase shifters (or phasers) get their sound by creating one or more alterations in the original sound signal's frequency. Amplifiers - There are many differences between tube and solid-state amps. One of the main differences is that to some listeners, tube amplifiers tend to have a warmer, distorted sound. Solid-state amplifiers, which pass the signal in a more efficient manner, do not generate this distortion. Hence, solid state amplifiers can be said to produce a cleaner sound. Microphones - Every type of microphone regardless of quality or internal components will have different sound and response characteristics. There is no one "correct" microphone to use for a particular type of music. It is important that you try different microphones until you find what works for your own individual sound and is the "correct microphone" for you. There are four common types of microphones which are grouped by their internal components. They are: Ribbon, Dynamic, Condenser and Crystal & Ceramic. Equalizer - Equalizers boost or cut specific frequencies in a signal. The most common equalizers are tone controls. They tailor your sound to suit your music. They can also be effective in eliminating feedback for a particular amplifier and microphone combination. DI Box - DI boxes perform three important roles: they provide a split audio path for an audio signal; one that goes to the amplifier input and another that goes to another device like a mixing console or sound system. They also provide electrical ground isolation between input and output, and they match the impedance of the source signal to that of the load. For example, a DI box with a high input impedance and a low output impedance may be used to match a microphone to the input stage of a mixing console.